This healthy fall broccoli salad is gluten-free, grain-free, vegetarian, and is bursting with autumn flavors! 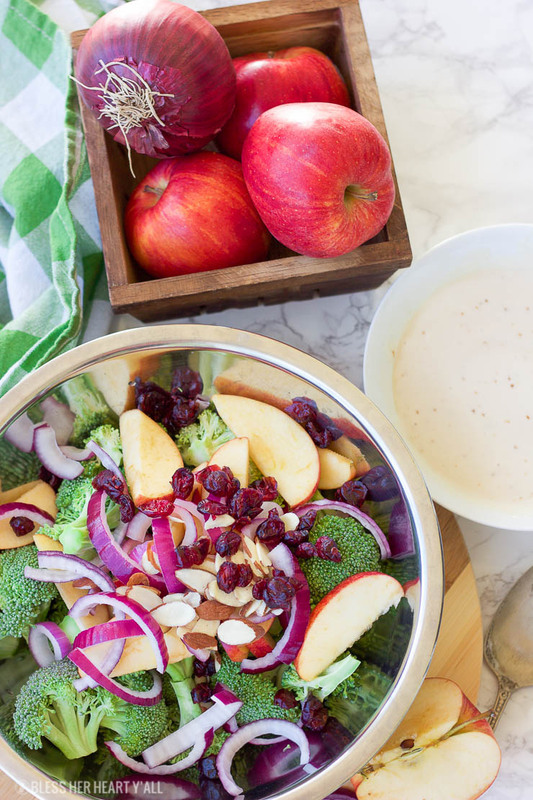 Greek yogurt, honey, lime juice, fresh and dried fruits, and almonds are tossed together to create a light, sweet, and creamy drizzle that’s perfect for any fall table setting! Y’allllllllllllll! Do I have a doozy for y’all today! But can we just take a sec and ask ourselves how the heck it’s Fall already? Where did summer go? This year is going by fast! Holy moly! 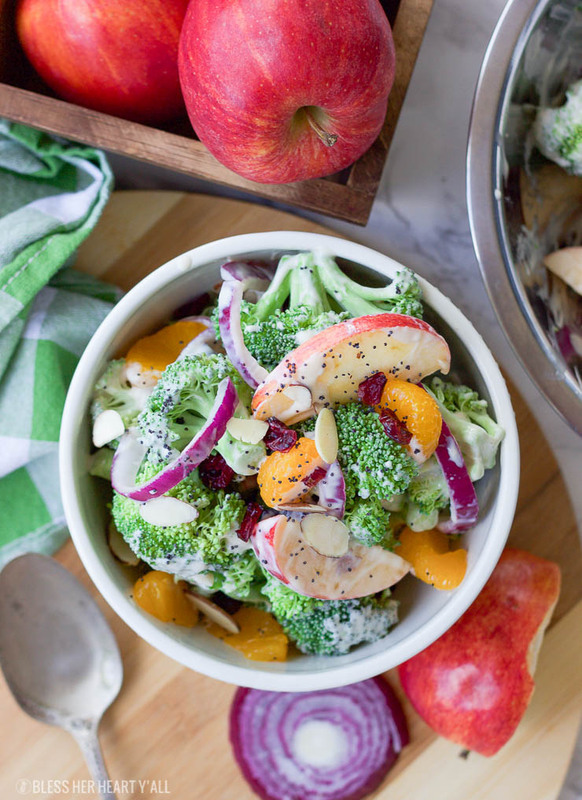 With time speeding by it’s nice to have a salad that can take you from the end of summer right into fall and that’s just what this healthy fall broccoli salad does. 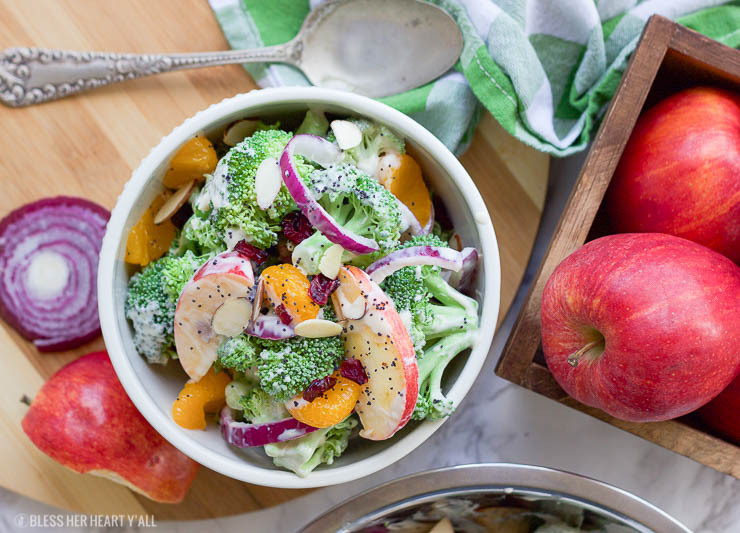 This healthy fall broccoli salad cuts up fresh broccoli florets, juicy apple slices, orange pieces, and crisp onion. I then combined some sliced almond pieces for some crunch and some dried fruit nibbles for a little bit of ‘chewy‘ next to the crispy crunch mix. I combined plain greek yogurt with fresh lime juice, honey, white wine vinegar, and a dash of blonde coconut sugar. Drizzle that biz all over all the veggies and fruit chopped up in that big bowl of yours. And that my friends is a fannnnnn-freakin-tastic fall salad! For an added bonus I added a few poppy seeds on top because I love the little pop of crunch it adds to the creamy, sweet, and tangy coating. Y’all want the 5-minute recipe yet? Okay okay, I give. Here it is! This healthy fall broccoli salad is gluten-free, grain-free, vegetarian, and is bursting with autumn flavor! Greek yogurt, honey, lime juice, fresh and dried fruits, and almonds are tossed together to create a light, sweet, and creamy drizzle that's perfect for any fall table setting! 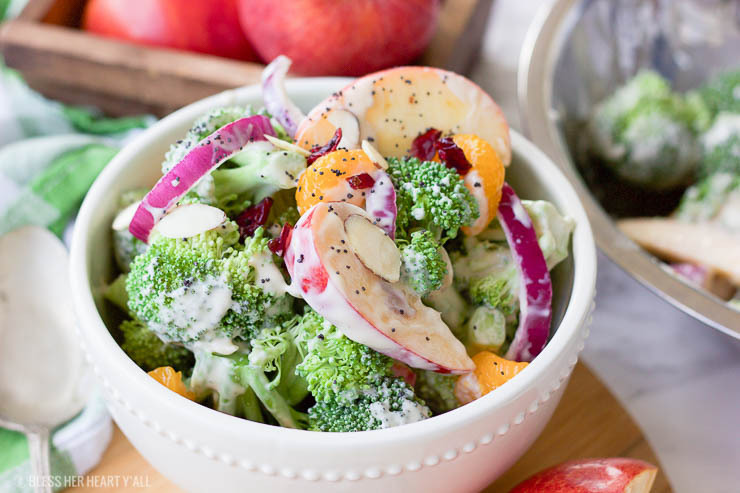 In a large bowl, combine the broccoli, onion, almond slices, dried cranberries, and orange pieces. Set aside. In a medium mixing bowl combine the greek yogurt, honey, lime juice, sugar, and vinegar and stir until well combined. Drizzle the sweet and tangy cream sauce over the fruit and vegetables and stir carefully until evenly coated. Serve immediately or store in the fridge in an airtight container up to a few days. No dried cranberries? No prob, use raisins or any other dried fruit that you have in your pantry. Don’t have coconut sugar? You can substitute white or brown sugar in equals parts. The dressing will tend to become closer in color to the sugar in which you use. 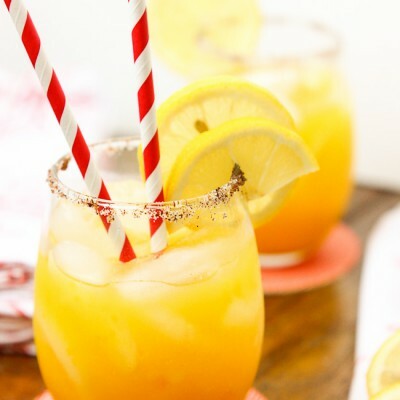 If you don’t have fresh oranges you can either use canned mandarin oranges (I would highly suggest draining and rinsing the crap out of the canned variety to rid your oranges of as much of that acidic juice as you can) or use some peach slices. Yuuuuuuuuum! No fresh lime? You can sub it out for lemon juice too. I know that this recipe is going to be a favorite with readers. 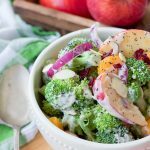 My basic Skinny Greek Yogurt Broccoli Salad is one of my most popular post and for good reason. 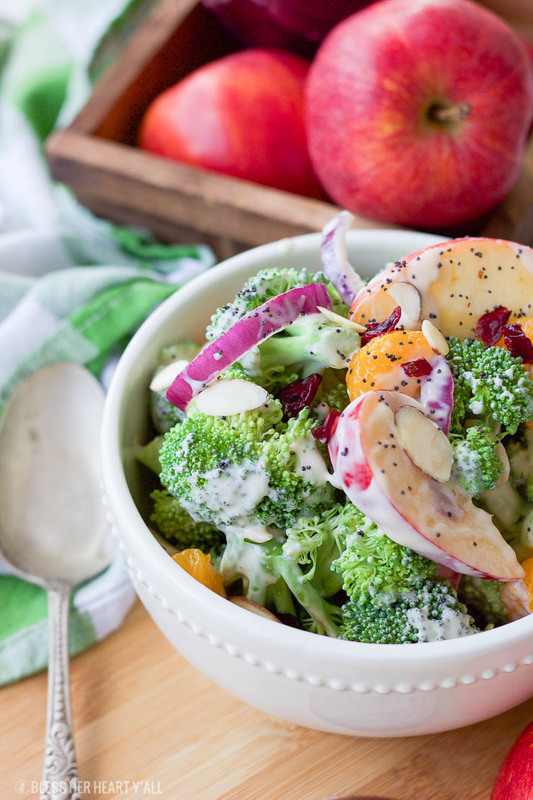 These broccoli salads are both healthy and more than DEEEEEElicious y’all. Go get you some. Broccoli salads are a favorite at our house. So crunchy and fresh. Your recipe is a great combination of flavors. Thank for the recipe! I think that I could eat an entire batch of this by myself! Yes! 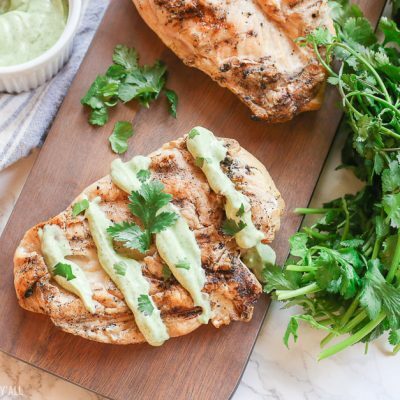 I would think that this recipe would taste just as amazing with fresh steamed broccoli! Great idea! 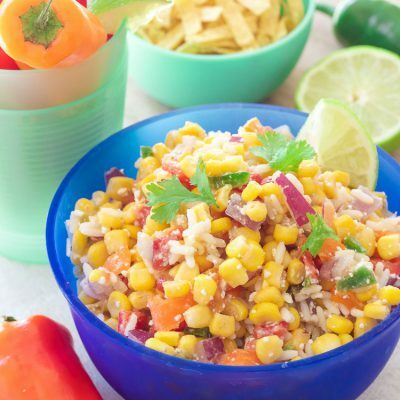 Maybe it’s the mixed textures and flavors of this recipe, but it sure looks and sounds delicious and healthy! O that is a great cold weather salad! I’m a huge fan of Broccoli salads, but I’m not I’m not too sure why. This one looks scrumptious. I love the addition of the apples, I’m sure it adds a sweet crispy crunch. I don’t know why I love them either but I do! Somethings you just can’t explain…. the meaning of life, the chicken or the egg, broccoli salads…. the list goes on and on. 🙂 The apples and the onion do give it a really nice crunch!